Founded in 1940, Nucor (NUE) manufactures steel products in the U.S. and Canada and began operating its first mini mill in the late 1960's. With production capacity of almost 27 million tons, Nucor is the largest manufacturer of steel products in North America. Nucor is also the nation's largest steel recycler, having converted 18.8 million tons of scrap steel in 2017 into new, salable products. 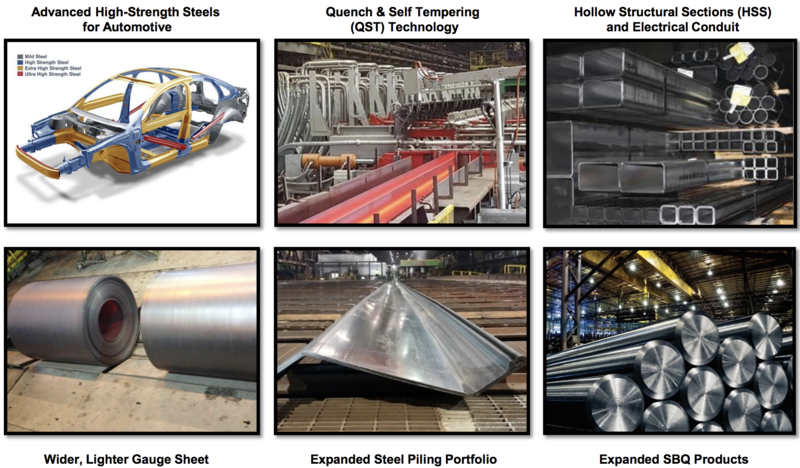 Some of the main products Nucor manufacturers are carbon and alloy steel (used in bars, beams, sheets, and plates); steel piling; steel joists; steel deck; concrete reinforcing steel; cold finished steel; and steel fasteners. Steel is sold into a variety of end markets, but non-residential construction and automotive markets are the biggest sources of revenue for the company. Nucor reports its results in three segments. As you can see, the company's business is dominated by producing steel in its highly advanced mills. With 45 straight years of annual dividend increases (since 1973), Nucor is a dividend aristocrat and in five years becomes a dividend king. Nucor is in a tough business. The price of steel is extremely volatile, short-term demand trends are unpredictable, raw material costs can significantly fluctuate, and many overseas competitors are happy to irrationally flood the market with low-cost supply. When combined with the capital intensive nature of manufacturing steel, it's not surprising that many American producers have declared bankruptcy over the years. In fact, from 1948 through 1958, American steel mills averaged nearly 700,00 workers. Less than 85,000 people still work in the country's steel mills today, per CNN. Despite the industry's challenges, Nucor is one of just 32 companies in America (out of over 4,000 publicly listed ones) that has raised its dividend for at least 45 consecutive years. What has allowed America's largest steelmaker to buck the trend and deliver such consistent income growth over nearly half a century? In a commodity business such as steel, it’s all about cost and financial discipline. Nucor runs an extremely lean business model that has made it one of the lowest-cost producers in the world. Steel is generally manufactured in one of two ways. Traditional steel mills rely on iron ore, blast furnaces, and unionized labor. Approximately 70% of the world's steelmakers use coal-fired blast furnaces to make their products. Nucor takes a different approach, using electric arc furnaces known as mini mills. Mini mills use recycled metal, steel scrap, and electricity to manufacture steel. These raw materials are usually cheaper than iron ore and require less labor and capital in their manufacturing process. Mini mills also run off natural gas-fired generators, which are far more efficient than the technology used by traditional steel mills. This is why Nucor's energy usage per ton of steel is about 75% less than the global average. Mini mills are also advantaged since scrap prices also tend to move with steel prices, providing a bit of a hedge throughout the steel cycle (i.e. if demand for steel falls, Nucor’s primary input cost will also likely fall in price, helping protect gross profit to an extent). As a result, mini mills have more variable cost structures and production schedules that can be quickly adjusted up or down in response to market conditions. Besides its scale and network of efficient mini mills, Nucor maintains one of the industry's lowest cost structures for two other reasons. First, the company's workforce of 25,000 employees is non-unionized, unlike most of its U.S. rivals. As a result, Nucor avoids the high legacy costs associated with pension funds. Over 60% of its workforce's pay is also in the form of incentive bonuses, which helps protect the company's profits during periods of depressed demand. Besides labor, the other major input cost is raw materials, including energy (natural gas) and iron. To minimize its costs and decrease margin volatility, Nucor has become very vertically integrated, meaning it sources most of its inputs internally. For example, in 2012 Nucor began a partnership with energy company Encana (ECA) to drill for shale gas in North America. In 2016, the company acquired a 49% stake in 54,000 net acres from Encana in order to ensure adequate access to low cost gas, which is the principle energy source for its electric furnaces. However, the biggest way Nucor lowered its input costs was by building the country's largest steel recycling system. Most of Nucor's steel production is made with low cost recycled scrap today. To ensure the lowest possible prices for scrap steel, in 2008 Nucor bought David Joseph, America's largest scrap steel broker, for $1.4 billion. The other major input is iron, specifically direct reduction iron, or DRI. Since DRI doesn't need to be melted, it greatly lowers energy usage and thus production cost. Nucor plans to increase its use of DRI in the coming years so it can create higher-quality products that are more profitable and less subject to import competition. This is why Nucor has built several highly efficient and largely automated gas-fired DRI plants ($3.5 billion investment) and plans to build several more in the future. These plants provide Nucor with the iron it needs at a lower cost than even cheap foreign imports. DRI also is also advantaged compared to scrap steel since it has far less impurities, resulting in a higher quality product. As a result, Nucor is able to offer a wider range of higher margin steels and steel products than most of its rivals. In addition, these higher quality steels can actually be produced with a mix of DRI and scrap steel, which means even lower production costs for the company (and greater profitability). The third key to Nucor's success is its massive economies of scale, which the company has spent a fortune on expanding. For example, Nucor has invested $11.9 billion since 2008 to expand and upgrade its manufacturing facilities. The company has also been aggressive on the M&A front with $2.9 billion in acquisitions since 2009. Nucor's recent acquisitions include new mills and production facilities but also downstream product makers that help diversify the company's business and hopefully decrease volatility in the coming years. Nucor is very opportunistic with its acquisitions, timing them to coincide with frequent industry downturns. For example, in late 2016 Nucor made three acquisitions of tubular steel companies which came cheap thanks to the oil crash (energy companies are one of the biggest buyers of tubular steel). Nucor was able to vastly increase its sales in downstream steel products (more than doubling its exposure since 2006) which should help open up greater growth avenues in the future and also maintain higher capacity utilization at its mills over time (boosting margins). Thanks to its vertical integration and economies of scale, Nucor boasts a very impressive record of profitability. Since 2010 Nucor has turned a profit every year. In fact, since 1966 Nucor has only generated a loss in one year (2009). In contrast, U.S. Steel (X) has lost money in seven of the last eight years. Meanwhile, AK Steel (AKS) has lost money in each of the last eight years. Over entire industry cycles, Nucor has always had much stronger returns on invested capital than its rivals, demonstrating the disciplined and high-quality nature of its management team. Another competitive advantage for Nucor (and a key reason its dividend is so safe despite the volatile nature of the industry) is its very strong balance sheet. The company earns an A- credit rating from Standard & Poor's (the best in the industry), ensuring it can borrow cheaply in almost any economic or interest rate environment. Simply put, Nucor has the financial flexibility to continue investing aggressively in its growth plans, including expanding capacity, improving efficiency, and making further bolt-on acquisitions to diversify its business and decrease cash flow volatility in the future. Overall, Nucor is the best house in a bad neighborhood and should remain well-managed as the company continues executing on its key growth drivers (remaining a low-cost producer, attaining leadership positions in product lines, expanding higher-quality and higher-margin production, expanding and leveraging downstream channels to market, and achieving commercial excellence to complement its operational strength). Nucor is arguably the best run steel company in America, but it still faces numerous risks. First, steel prices are extremely volatile over time. 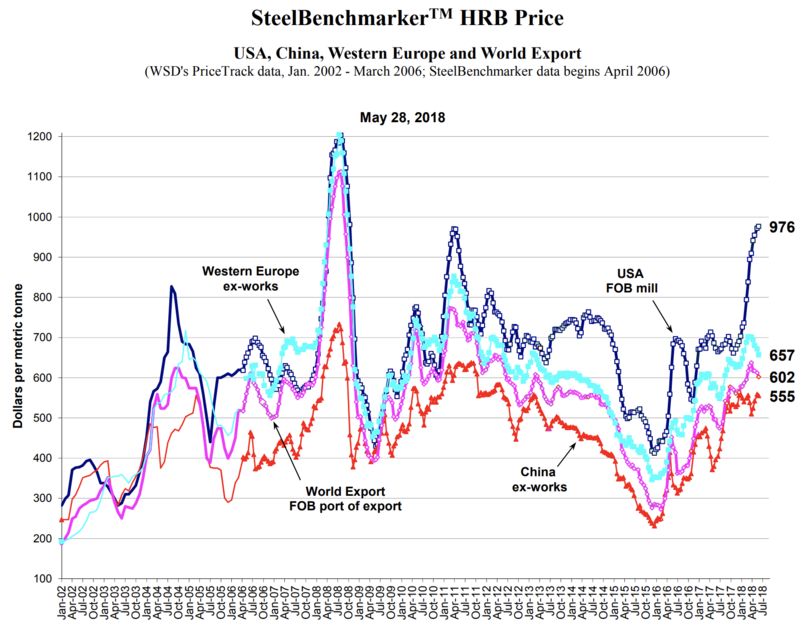 The chart below shows the price of hot-rolled band (HRB) steel over more than a decade across several different regions. These price swings alone make stable sales and profits extremely hard to accomplish over time. While Nucor has done a great job in the past decade minimizing the risks of its input costs (like scrap steel, iron, and natural gas), cyclical shifts in the prices of these raw materials can still significantly affect its bottom line. For example, in the first quarter of 2018 rising gas prices added $1 per ton in production costs and scrap steel prices soared 19%. This means that Nucor's margins are at risk from both sides, steel prices and input prices. Speaking of prices, the recent 25% steel tariffs imposed by the U.S. are seen by many as great news for domestic steelmakers. And in the short term, it will likely result in much higher steel prices. In fact, just the announcement of the tariffs caused U.S. hot rolled steel prices to spike over 30%, more than the tariff amount. However, it's important to remember that higher steel prices can greatly hurt the margins and potentially even the sales of steel end products in the manufacturing sector. For example, car makers will now have to pass on higher input costs via higher vehicle costs which could end up hurting sales and preventing a recovery in the automotive sector. Most of the company's sales are to cyclical industries, notably commercial construction and the automotive industry, so any major shift in demand would highly impact Nucor's results (especially given its high operating leverage). While commercial construction is doing well thanks to nine years of a strong economy, the automotive industry is facing declining auto sales. Fortunately, short-term declines in these markets shouldn't impact the company's long-term earnings power. Back to the risk of geopolitical tensions, Canada and Mexico have said they will retaliate against U.S. steel companies with their own 25% tariffs, meaning that Nucor might be facing a competitive disadvantage in its promising new growth markets. Trade wars a double-edged sword in another way as well. For instance, the Trump administration has spent the last 18 months renegotiating NAFTA via eight rounds of talks that have now stalled. NAFTA, which has been in effect for 24 years, has become the backbone of North America's manufacturing supply chain. This means that parts of industrial materials, such as cars and trucks, are frequently built in all three countries and currently enjoy no tariffs. However, President Trump has warned that he might pull out of NAFTA entirely, which could have potentially devastating impacts on America's economy. Basically, the risk is that the strong economy that has been such a tailwind for Nucor since 2009 could very quickly face a major slowdown. Even if the U.S. and its trade partners manage to avoid a major trade war, there is still another important issue for Nucor investors to consider. The company's dividend growth streak, while impressive, is also painfully slow. For example, since 2009 the dividend has been growing at about 1% per year. While Nucor's potential earnings growth might be high in the coming decade (if the U.S. avoids a trade war and recession), the company has made it clear that its top priority isn't fast dividend growth but investing in expanding the business. Since Nucor's business model is so variable, and its management team so conservative (a good thing for steel companies), dividend investors might have to deal with many more years of token 1% dividend increases. Nucor is a very well-run company, and its dividend payment is on solid ground. Management has proven it can adapt the business to very challenging conditions over time while rewarding shareholders with one of America's longest dividend growth streaks. However, the steel market is highly volatile and dependent on a number of exogenous factors. While Nucor’s operations are very efficient and management is doing all of the right things, the company ultimately has no control over the many headwinds that can unexpectedly challenge its business. As a result, Nucor's painfully slow dividend growth could continue for the foreseeable future. When combined with the stock's relatively low yield, conservative dividend growth investors are likely better off focusing their portfolios on companies in other areas of the market. Investing in the steel industry can be quite the rollercoaster ride and is not for the faint hearted.